Last weekend only half of the roof was sheathed. The rain in the Otter Lake area has been phenomenally frequent this year. It has rained everyday, often twice or three times a day - hence, it has been difficult for the roofing contractor to get any headway on the roof. 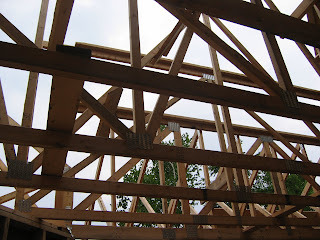 This first pictures is looking up from inside the main floor towards the lakeside of the Cottage. Lots of roof trusses but no sheathing yet. Fortunately, they have been able the sheath the front half of the roof. You can still see a bit of sky yet as the shingles and flashing are not yet on the roof. 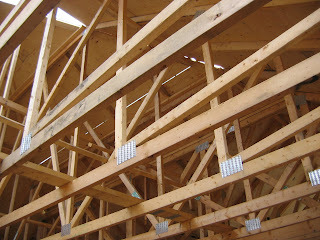 ASIDE: if you look closely you can see some of the lateral bracing - between trusses - that we installed. Most of that braced is called for by the instructions provided by the truss manufacturer, however, we did ad a bit more. Most of this added bracing was as a result of bracing we used to steady and secure each truss as we added them. In most of the cases we just left them in.